Greetings! This month’s e-letter focuses on some exciting new works by several of my favorite glass artists. Some of you have suggested that I write a little about each piece I feature and I like that idea. I hope you enjoy this issue and look forward to your comments and questions. I also wish you a happy spring which, hopefully, is just around the corner. UFO 2 by Steven Weinberg: This dynamic piece by Steven Weinberg represents an exciting new development in his work. I have represented Steven now for over 25 years and have witnessed many changes and breakthroughs in both his techniques and his forms. I love the circular form containing circles within circles within circles. It reminds me of the concept of the music of the spheres. I also really like the canes which seem to float randomly through space. Insatiable Blue Vortex by Stephen Powell: This piece is from a series of new, smaller works that Stephen has been making. It’s wonderful to see all of the color and energy of his larger works condensed into a much smaller form. The particular color combination that Stephen chose for this piece is immensely appealing to me. Basket by Preston Singletary: I have just gotten access to several pieces from Preston’s Basket series. This one was recently shown in an exhibition at the Heard Museum in Phoenix. I love the elegant simplicity of the colors and the graphics. I think of it as a very regal piece. Please let me know if you’d like to see other pieces from this grouping, many of which are not on my website. Amethyst Filigree Cloud by Nancy Callan: The pieces in Nancy’s Cloud series seem to get more and more sophisticated and beautiful all the time. Nancy says that this one is “hot off the press.” It is her most recent piece and one of my very favorites. 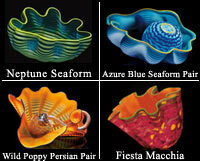 Studio Editions by Dale Chihuly. I decided to feature both the new 2011 Studio Editions and also show those from 2010 one last time. 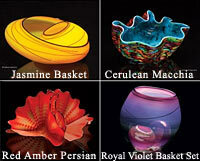 I think that it is wonderful that Chihuly, in the midst of creating many very large scale installations for projects around the world and preparing for several major museum exhibitions, still offers these smaller versions of his best known series: Seaforms, Persians, Macchias and Baskets.